Animal behaviorist and author Alexandra Semyonova1 provides key safety rules and guidelines for owners of dangerous breeds. If you own a normal dog, please see our rules for normal dogs. The number one rule with these dogs is: Always have a break stick handy wherever the dog is present. This means indoors and outdoors. A break stick can keep you or police from having to kill your dog to make it release if it grips someone. Do not count on spaying or neutering to make these dogs safer. Spay/neuter does not change genetically determined behavioral traits in any dog. Neutering does reduce the risk of a male dog escaping if it smells that a female is in heat somewhere. Spaying reduces the risk that a female of this class of dogs will attract other dogs when she goes into heat, which she may then attack. Spay/neuter is also crucial to reducing the numbers of these dogs that are being put down in shelters because they are too dangerous or because nobody wants them. Dogs of this type should be socialized to feel comfortable in a wide range of situations. However, be sure to protect others as you try to socialize your dog. “Socialize your dog” does not mean “make your dog socialize.” The point is to get the dog to feel comfortable, not to force the dog on others in a way that endangers them or their pets. Do not count on socialization to make your dog safe for other dogs and animals, for guests, for children, or even for yourself. Socialization only reduces the risk that a dog will become aggressive due to fear. It does not have an effect on any other type of aggression. Be aware that sufficient physical and mental exercise will not prevent your dog from becoming aggressive. When exercising the dog, take precautions to keep others safe. Play fetch with it in your securely fenced backyard, or take the dog out leashed for a several mile jog. Contrary to what some television programs tell you, you should not over-exercise these dogs. Lack of exercise is not what makes them aggressive and over-exercising them will not make them safer. Use reward-based methods to teach your dog basic commands. This will make it easier for you to manage the dog. Coercive or violent training methods will only increase the possible triggers for your dog to attack. Do not count on the dog to follow commands even it knows well at all times. Knowing commands will not make your dog safe. When these dogs are triggered to execute their inherent behavior patterns, they often become unable to interrupt the behavior sequence in response to any command. This class of dogs should always be securely contained when not supervised by an adult. This means having the dog in an enclosure such that children can’t access the dog or let the dog out. Many children have been killed by this class of dogs while their parents were out of sight just for a few seconds. These dogs should never be left alone with any other animal, no matter how long they’ve lived together in seeming peace. If you allow the dog free in your yard, the yard must have secure, closed fencing that it can’t climb, dig under or otherwise escape. The fencing should be such that passing children can’t poke a finger or hand through the fence or open a gate. An electric fence does not prevent escape, nor does it prevent children and animals from approaching your dog. The same goes for chaining. These dogs must never roam the neighborhood. They must never be off leash in any public place. This class of dogs is not meant to be the constant companion dog that goes everywhere with you. They are out of place where you and the dog can’t keep sufficient distance from others to prevent even the leashed dog from hurting someone. You should not take the dog to this type of place even if you muzzle it. A muzzle will prevent serious bites if it doesn’t slip, but it won’t prevent both people and the dog from being traumatized if the dog tries to launch an attack. Do not walk a dog too big for you to restrain. You do not have control of a dog if the dog can pull you off your feet or drag you where it wants to go. The same caution applies for letting your child hold the leash or walk the dog alone. Do not let your teenager walk your dog. Teenagers are often tempted to take irresponsible risks, then unable to prevent or mitigate the consequences. These dogs must always be leashed in public. It is preferable to also muzzle them. The leash should be no longer than 6 feet. Do not use a retractable leash under any circumstances for this class of dogs. Always carry a break stick in case a child or another dog approaches your leashed dog and the dog suddenly grips. Do not try to impose the dog on others. If people cross the street to avoid passing your dog, accept this as one of the consequences of owning this type of dog. Do not allow your dog to approach other dogs during the walk. Do not tell children it’s okay for them to pet your dog, even if the dog seems okay with your own children. You have chosen to take a certain risk, but it’s not fair to insist others share that risk. This class of dogs is always dangerous for other dogs. No matter how well-socialized you think your dog is, you can never trust your dog not to fight. If it fights, it will not be a symbolic scuffle as is the case with other types of dogs -- your dog will be intent on killing the other dog. Your dog does not need to be with other dogs to be happy, and you will be protecting the lives of other dogs. You will also be protecting your own dog from impoundment or euthanasia. This may seem cruel to you or be emotionally difficult, but you have no other real choice. Training will not reduce the risk the dog now presents to that family member. Once a dog of this class has decided on a target, it normally will not desist until that target is dead. Chased off the scene of an attack, they often return later to as yet kill what they’d targeted. Consider that no matter how much you love the dog, it’s not fair to your children to make them live with an animal that they know is a threat to them. Do not try to prove that your dangerous dog is harmless by putting it in situations where it can hurt people and other animals. Resist the temptation to take risks that put people, animals and your own dog in danger. If you want to protect the reputation of this type of dog, the best way to do that is to obey the rules we have listed here. 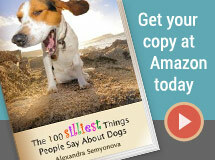 Learn more about animal behaviorist and author Alexandra Semyonova by visiting her website, Nonlinear Dogs. Excerpts and several chapters of her book are located on her website.